Santiago Street Lofts for sale are centrally located in downtown Santa Ana just on the corner of N Santiago Street and East Santa Ana Boulevard. These fantastic lofts offer you the best in live/work properties just minutes to some of the trendiest restaurants and stores in the area. Santa Ana Boulevard leads to the I-5, which will get you anywhere you want to go in no time flat. These lofts are all about having a stylish, modern living space combined with a large work space, within one of the best communities in the city. Leave the car behind as you enjoy exploring and doing your daily errands by foot. There's nothing better than having everything you need on one space. It saves you money and time, which allows you to focus on living your life to fullest! Keep in touch with Nook Real Estate by registering with us today! 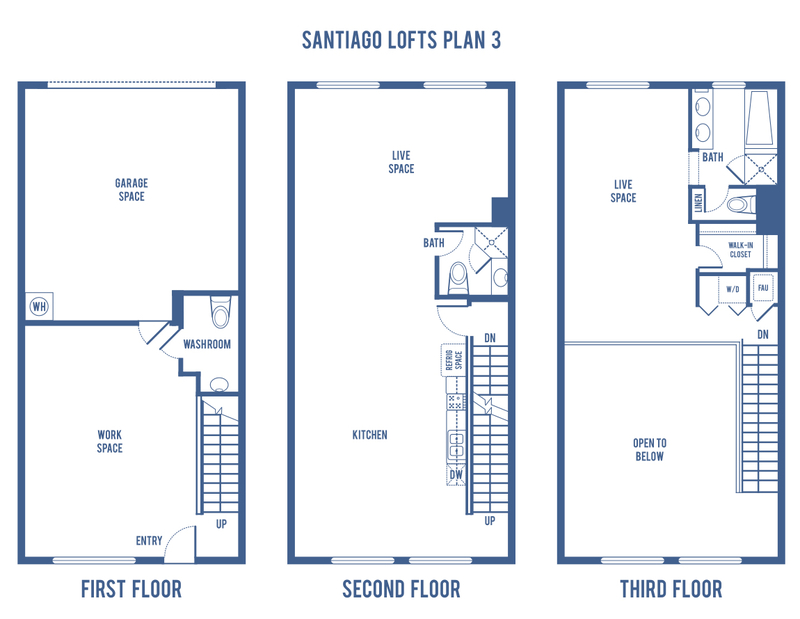 Let us help you find the Santiago loft you have been dreaming of! Santiago Street Lofts, Santa Ana are some of the most aesthetically pleasing and unique Downtown Santa Ana development built to date. The playful colors and various exterior facades break-up the large project in a way that keeps your eyes coming back for more. Santiago Street Lofts are also one of only a few Orange County developments that are 100% Live/Work Lofts. All of these units have a ground level work space, which helps the neighborhood gain the much needed retail spaces to attract gallery goers and shoppers. The floor plans of these units start with around 1,580 square feet and go up to just under 2,300 square feet of living space. 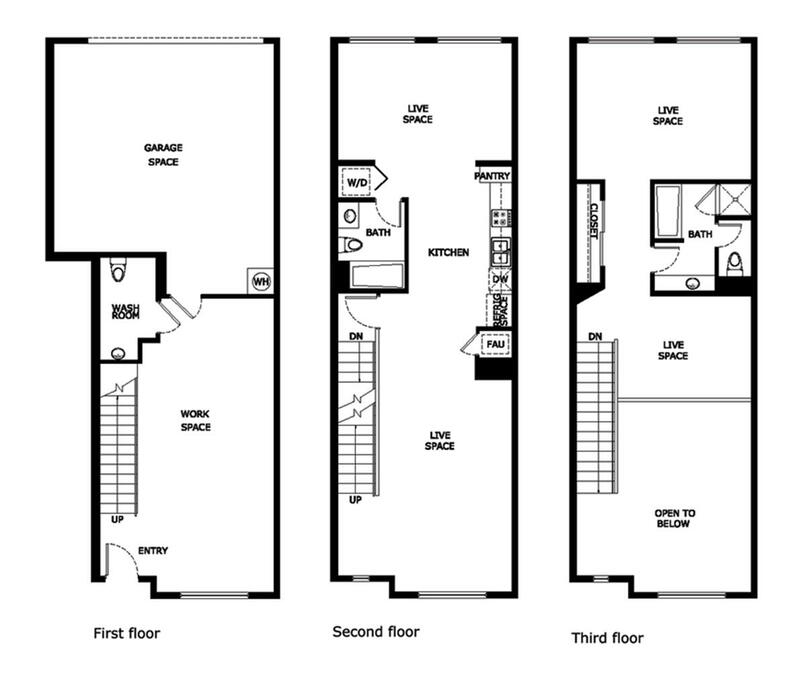 Regardless of the unit you choose, all of the floor plans have three levels of gorgeous living and working spaces. The first floor of each unit is where you'll find the work area and your 2-car garage. The work space can be used as your own private art gallery, various storefront businesses, or perhaps you could make the space your office. The separate entryway allows your clients easy access to you and your business offerings. The industrial roll-up door is a great way to truly open your space up and allow anyone walking by to clearly see the nature of your business. You have flexibility with the space and can create the business you have always dreamed of. As you make your way onto the 2nd floor, you'll find a very spacious kitchen and living space, with an optional dining room space to entertain all your friends. The large windows allow the light to flow throughout the room making it a truly enjoyable space to hang out in. Your family and friends will be impressed with the modern, sleek design of the unit, along with the sought-after open plan concept. The top floor of the loft has the master bedroom space, with a large master bathroom and walk-in closet. The bedroom is in typical loft style, which means it is open to the floor below. You'll have a light, airy feeling as you move throughout the top two floors of the stunning Santiago Lofts. 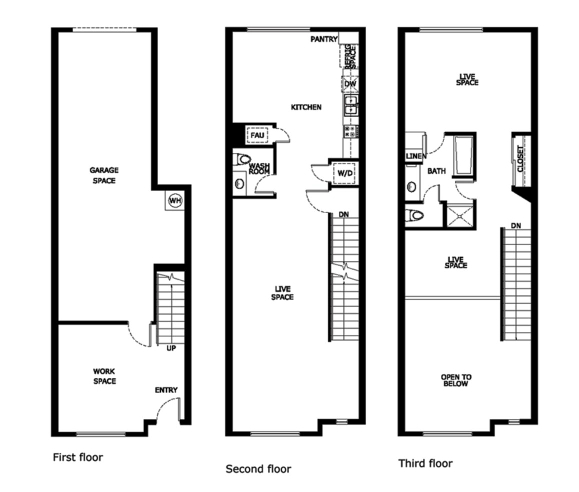 In lofts of this caliber, it's expected that you'll find a gorgeous interior space. All the additional light provided from the open section on the third floor just adds to the grandiose feeling of space. You'll commonly find granite countertops, high-end appliances, and a large kitchen island area that is perfect for preparing meals while friends sit opposite you enjoying a pre-dinner cocktail. Beautiful hardwood flooring can be found throughout the unit and updated spa-like bathrooms are a welcome addition to these lofts. Santiago Street Lofts is the closest to Santa Ana's Amtrak Station. Just around the corner, one block from the community. Not as vital now, but as gas prices continue to rise and new rail is built, including a highly speculated over high speed rail from San Francisco to Los Angeles, living in such short walking distance to train stations is becoming a greater selling point. Imagine a future where you could walk across the street and be in San Francisco in 3 hours via high speed rail ... very exciting! It's a few more blocks to Downtown Santa Ana's restaurants, bars, galleries and theaters. Home to many artists and creative professionals, the Santiago Street Loft Residents organize their own Santiago Art District with monthly art walks on the 3rd Saturday of every month from 7pm to 10pm. Doors roll open, gallery lights go on and anxious hipster and art goers pursue what's new. Live music and refreshments are a common sighting in this fabulous community!